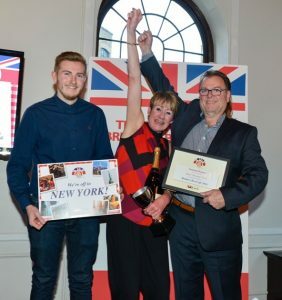 The result was announced at a presentation lunch on Tuesday, 22nd November held at London’s Chiswell Street Brewery, where representatives from 14 regional finalists gathered to hear who had won the much-coveted title of Britain’s Best Cafe and a four-night, five-day trip to New York City. Andrew Wakelin, Managing Director of SIG Roofing hosted the presentation lunch and welcomed everyone on behalf of the company. Andrew offered his thanks and congratulations to all those who played their part in the highly successful competition, which was organised to recognise and celebrate the relationship between the local SIG Roofing branches, its customers, the cafes and the local community – where they all meet to enjoy great food and company. Finally, with tension mounting, the National Winner was announced and the jubilant team from Super Sausage Café stepped up to take their trophy and the prize of a four-night trip to New York City, as Britain’s Best Cafe. Cafe proprietors Chris and Gail Murray bought the cafe in July 2009 – but its history goes back well over 60 years. The award is in recognition of Super Sausage Cafe’s popularity in the local community. They are renowned for their perfectly cooked full English breakfasts and have a real focus on offering quality food, sourcing locally wherever possible – all enjoyed either on the premises or as take-away-. The cafe boasts a huge car park, washroom facilities, an ATM and free Wi-Fi – just a few more reasons for its popularity! Now they will be heading off as representatives of cafe owners across the nation to see how the great British fry up compares to the best that Broadway has to offer in the famous Ellen’s Stardust diner – and to enjoy the sights and sounds of New York City, courtesy of SIG Roofing.